COLUMBIA Icefields Parkway is true Canadian gem linking Lake Louise with Jasper. This 232km long double lane highway deserves its place on the list of the most beautiful journeys in the world. And even though it is possible to drive it from one end to the other in only 3 hours, it would be more than foolish. One full day is an absolute must, splitting the road into two days is even better when time allows. 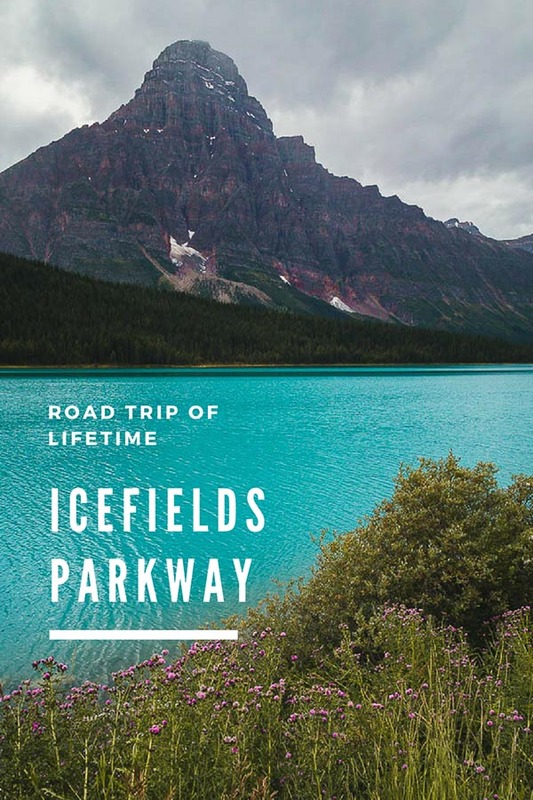 Icefields Parkway is not missing on any travel itinerary when visiting the Rockies so don't expect to have it just for yourself. Instead hit the road early and try to beat the crowd, especially big coaches carrying large groups. Stay Safe: It is easy to be enthralled by the ubiquitous beauty, but don't forget you are still on a busy highway so keep an eye on passing by cars and watch out for wildlife. Icefields Parkway offers beautiful sights along the road such as glaciers (supposedly more than 100! ), waterfalls, emerald lakes and of course mountain crests lining the way. The freedom how to plan the day was something we appreciated the most and this stretch of road was where we were the most grateful for having our rental car. Even though the highlights along the Icefields Parkway are easily accessible and can get crowded you still have a choice to personalize this day bit more as the choice of side trips is enormous. We traveled from the north to south, so our journey started in Jasper, all attractions below are sorted accordingly. This stop was insanely busy in the morning, the parking lot was full of tour buses and selfie lovers. The first, a not very positive impression was improved once we stepped on the bridge overlooking this waterfall. Athabasca Falls is not known for the hight but for the enormous quantity of water falling into the gorge. Tangle Falls is just one of many we could see from the car on the way. Take a short break and pull over. The 3491 meters high giant Mount Athabasca, looming over the Icefields Parkway and easily one of the most accessible glaciers in the world, just a short walk from a parking lot, make this place special. You can't see a lot from the glacier from the viewing platform as the mountains hide the rest, but even the "snout" is impressive more than enough. For a better view hike up to the Wilcox Pass. You can also join walking or coach tour to get the most of the glacier experience, but it does not come cheap. If you are concerned about environmental impact of these tours on the glacier, opt out. The first part is a steady climb which goes through thick forest until it reaches the first lookout, further up the scenery dramatically changes and you get an open valley view with fragile sub-alpine meadows, small lakes, and creeks. The main attraction is the view of Athabasca glacier and exploring the vast plains. Be prepared that it can get windy up there and pack a windproof jacket. One of the most rewarding hikes on the Icefields Parkway deserves its popularity. The moderate and short trek starts with series of switchbacks and goes up through the forest. Once you leave the tree line behind and the trail levels out the scenery is breathtaking. Continue further along the trail as the views on the Saskatchewan Glacier, the largest of the Columbia Icefields, get only better. Overlooking glacial valley with the opposite rock wall with waterfalls is almost indescribable and leaves you in awe. Spend extra time on the top and explore the ridge, it's worth it. This glacier-fed lake lures visitors all over the world because of its seemingly unreal emerald color and exceptional shape. Lake lies almost at the end of Icefields Parkway and is easily accessible from the parking lot. It is very near to the village of Lake Louise. Want to see more? Check our post about the most beautiful Canadian lakes here.